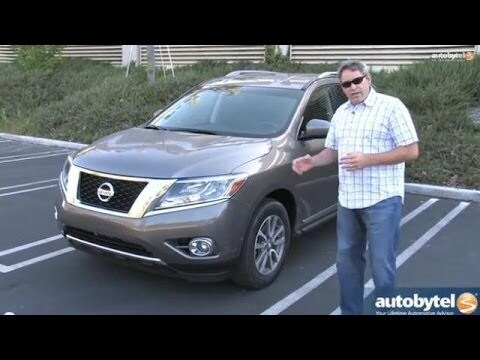 The Pathfinder has shed its former rough-and-rugged image to become one of the most enticing entrants among 3-row crossover SUVs. With comfortable accommodations, enjoyable driving manners and an efficient hybrid version available for 2014, the Pathfinder has a lot to offer as a family hauler. The TVs in the head rest are by far my favorite. My pathfinder sl is great on gas. It seats my family comfortably with room for guests on the third row seating on the back. The kids love the televisions in the head rest. They are dual televisions so they can choose to watch the same thing or they can watch separate shows. The only issue that I have had with this vehicle is the cvt transmission. When I am driving and I slow to make a turn or to stop at a light, once I begin to accelerate, the vehicle starts jerking as if it is about to cut off. This happens daily. I have taken the truck to the dealership and truthfully I don't know if there is anything that can be done. It will stop for a day and start back. I love the truck for all the comfort, gas, and reliability. If I could get the issue with the transmission corrected I would be so happy. Love it! Great on gas mileage. I absolutely love Nissan and love this car. This car is my 3rd Nissan I have owned. It is a large sized SUV but drives like a car. Very smooth. The only thing I would change is to get a newer model. I have mostly had great service with my current dealership. I have had only one person who gave terrible customer service and it was interjected pretty fast by another associate. They definitely made it right. As the car has gotten older I have noticed that if I change the oil a couple hundred miles sooner than I should and put premium gas in it every once in a while it drives like new. Overwise I can tell I am driving and older model. Again, love this car. Great on gas mileage. Versatile for my Family, Comfortable for the Vertically Challenged driver! This is the newest car I have ever owned, and I am very happy with it. First, I love where I am able to position myself for driving. I am a very short person and it is difficult to be in a comfortable position! Second, the space it offers is versatile. I can put the back seats down easily to carry large items, or I can have all of the seats upright and fit my teena and plenty of their friends comfortably. I really like that the middle row of seats is adjustable to increase leg room. The controls and buttons are fairly convenient and I like the option of monitoring my gas efficiency!